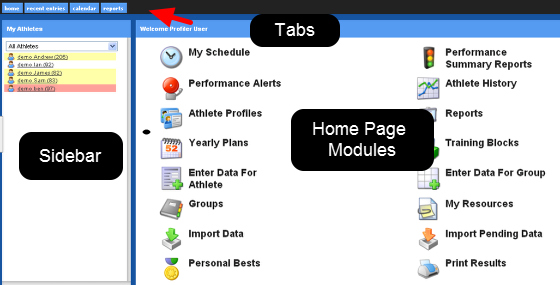 Each different type of user has access to different modules on the system when they login. All of the system permissions (the modules that you access) and data permissions (what data you can enter and/or view) is set up by your administrator. Please contact them if you have any queries about the system. Every system that is developed has different capabilities depending on the type of information you need access to and what you need to do with your system. You may have access to all or some of the capabilities shown in the image above. - Side Bar-shows all of the athletes in the group that you are viewing. - My Schedule allows you to see what is planned for your athletes today, shows individual events and groups events. The Schedule allows you to open and edit the events scheduled on any day. - Import Pending Data allows you to upload data from any system such as the smart speed timing lights. - Print Results is where you can select to print off session information e.g. a 4 week training cycle.